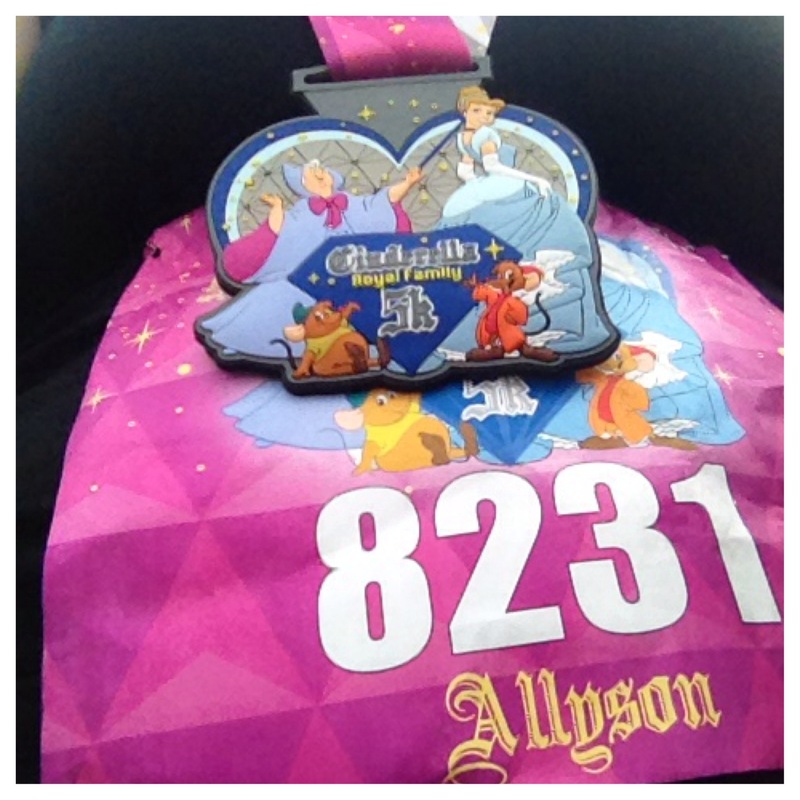 It seemed like a ridiculous idea, until I learned that runDisney does not just do half or full marathons. 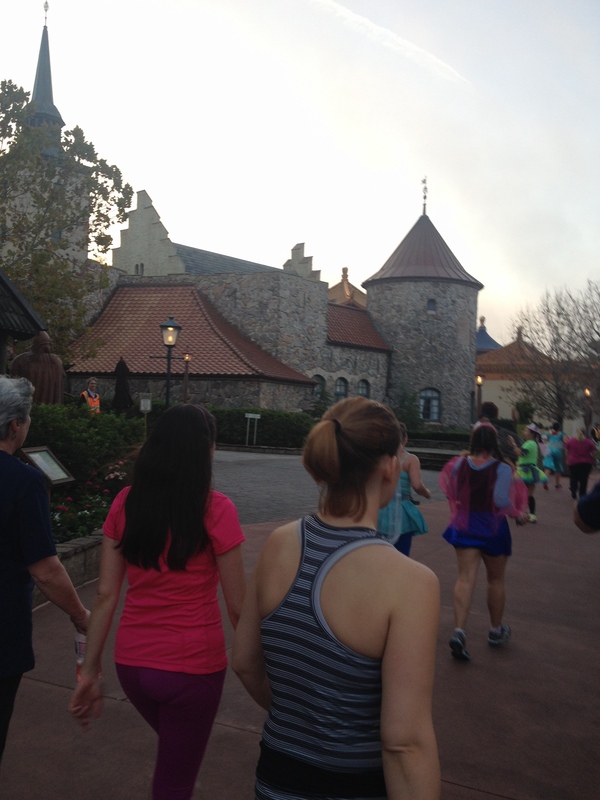 We opted for a 5k, the Cinderella Royal Family 5k during the Disney’s Princess Half Marathon Weekend in February 2014. It seemed far enough away, I could totally tackle a 5k. First of all, let me preface this story by letting you all know, I AM NOT A RUNNER, nor have I EVER been a runner. I run towards food and away from danger, that’s about it. I have a bad knee which has always caused me to shy away from running. Plus, I look terrible doing it. LIKE REALLY TERRIBLE. Anyway, I found myself signed up for this race that was seemingly forever away. I downloaded this great training app called Couch to 5K, I laced up my running shoes and I made a conscious effort to go to the gym at our apartment every Monday, Wednesday, and Friday, for two whole weeks. And do you know what happened? Shin splints. Both legs. They hurt so bad for so long that I walked funny and messed up my knee. I kid you not. Next thing I know it’s January, I’m sitting on my couch eating ice cream out of the carton with Justin reading our family calendar in the kitchen, “What’s this RF5K on here next month?” he asked. The answer was my wake up call. I then made a conscious effort to go to the gym every single day for 7 whole days. Guess what happened then? Shin splints again. To make matters worse, I get a call from my mom that she can no longer attend the race because she needs to attend a ball in Washington D.C. This for real happened. What felt like the next morning, I woke up realizing that I would run a 5k the next morning at 5 a.m. The time really snuck up on me. Remember, NOT A RUNNER. I talked a little with some friends who had participated in Disney races and they all assured me the 5k’s were totally chill—perfect beginner’s races, or racers for non-runners. But being the crazy control-freak that I am, I did my own research. 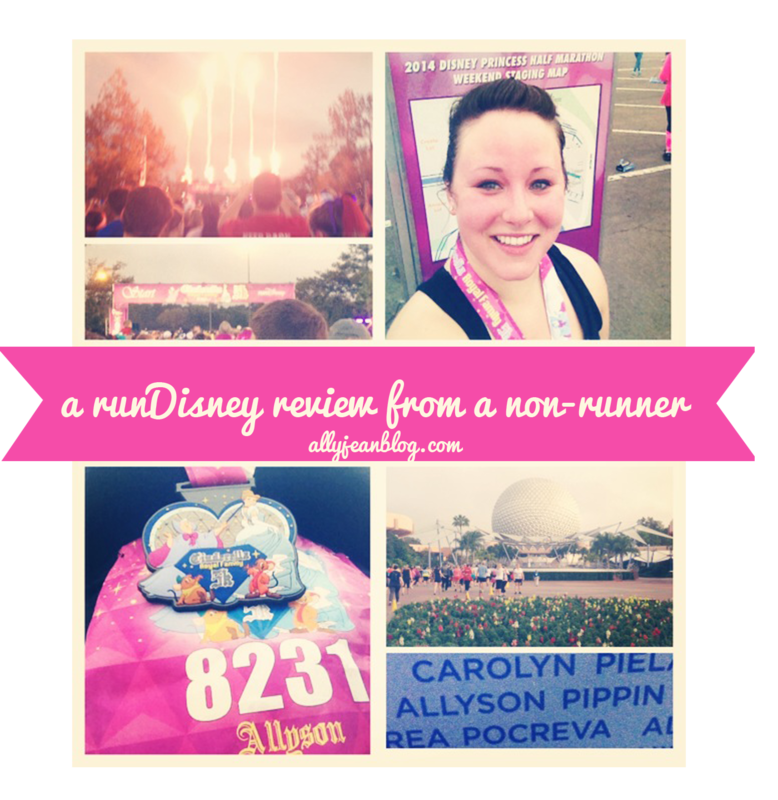 So here I am the night before my race, tearing apart every blog I could find dissecting a runDisney 5K (if you got here doing that, I feel you, sister!) I was reading about all kinds of scary things like keeping a maximum pace of 16 minutes/mile, of scary pargos sweeping the crowd to pick up people who aren’t going fast enough and suddenly I was an absolute wreck. 5 a.m. came far too soon, and I got dressed as sensibly as possible and drove out to Epcot. 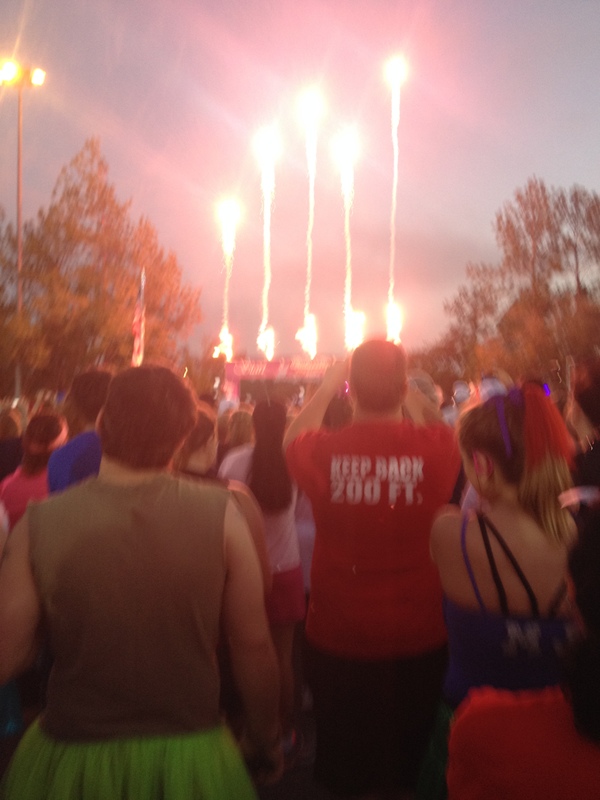 The first thing I noticed about runDisney races was that everyone was happy. Like excited happy—big goofy smiles, lots of 5 a.m. photo shoots, excited cheering when the DJ suggested everyone do jumping jacks. The second thing I noticed was that everyone was wearing really cute outfits. Like really cute. I was standing next to a woman in teal yoga pants, a teal bra, and a long black braid. Running as Princess Jasmine. So cute. Pre-race jitters were at an all-time high. Fun running? Not going to happen. About 45 minutes after corral A had stepped off, it was finally my turn. Next thing I knew, we were off! There were a lot of characters on the trail for photo opportunities: Princess Atta from A Bug’s Life, Jasmine with Genie, Mulan with Mushu, Snow White and Dopey, Beast. I did not stop for any photos (remember my irrational fear of those scary sweeping pargos), I would jog and walk for equal bursts of time (about 5 minutes each). It was so very cool running around the World Showcase at Epcot. I had walked that route so many times with Justin that it just felt like coming home. Next thing I knew, I was running towards Spaceship Earth. I stopped for a selfie. Contrary to how the photo looked, I felt great. I get very flushed very easily so I looked like I was about a step away from death, but I really felt great. 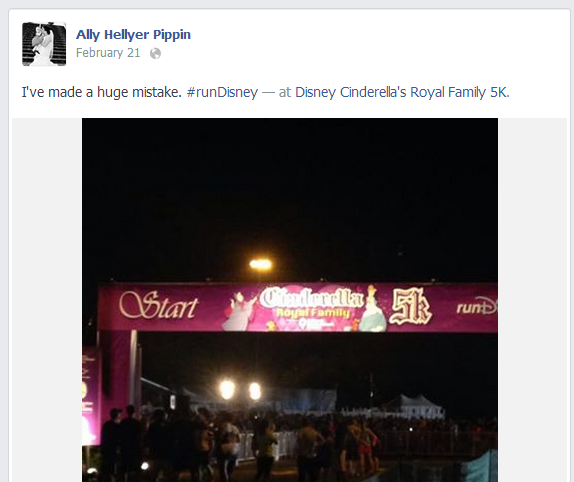 The people who runDisney races are so positive, encouraging, and nice! At one point I was walking a little slow and I had a woman jog past me saying “You’re doing a great job!” She didn’t even work there! 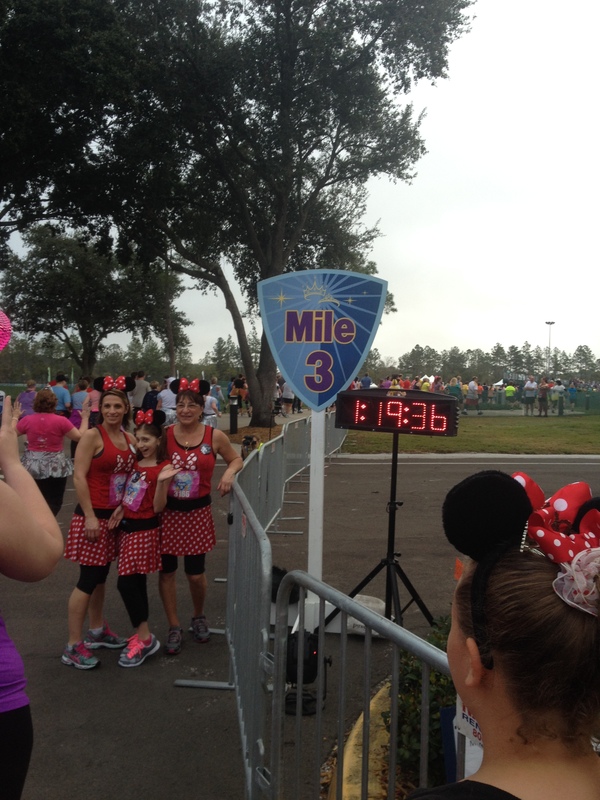 As quickly as the race started, mile three came along and I was sprinting for the finish line. I finished the race in 50 minutes without any sort of training, previous running skill, or belief that I could actually do it. Every person who finished the race received a finisher medal. They are made of rubber, but I was never prouder of something so silly in my entire life. The verdict? 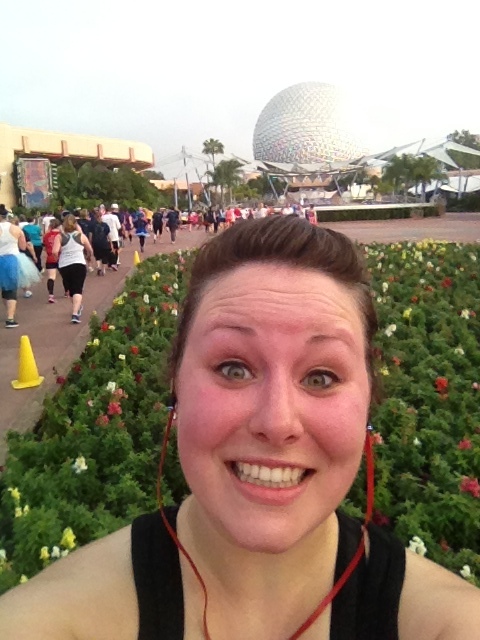 I drank the Kool-Aid, I loved the runDisney experience. I loved it so much I signed up for the 2014 Tower of Terror 10 Miler this October. I plan on actually training this time. 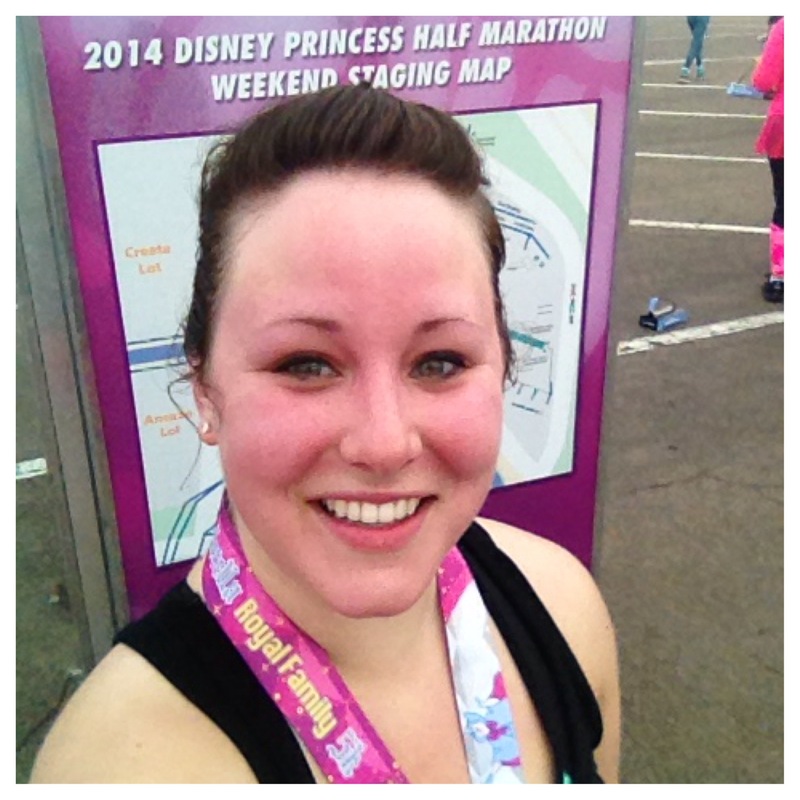 If you ever had doubts whether or not you could do a runDisney race, I’m here to tell you that you totally can. Running a race at Disney isn’t about the race or your time, it’s truly about saying you finished and overcoming personal obstacles. I’d love to hear from you all if you plan on participating in a runDisney race. Support is the best support you could ever ask for! As for your other questions, that end of May, early June time frame isn’t usually too busy. Many kids will have school for a few weeks after Memorial Day so it can be a lull time before the full-swing of summer. Things do change though so I’m not making any promises 😉 The good news is that Day Guests are now eligible for MyMagic+ (regardless of staying on property or not) you can make your FastPass+ selections early on, just in case.